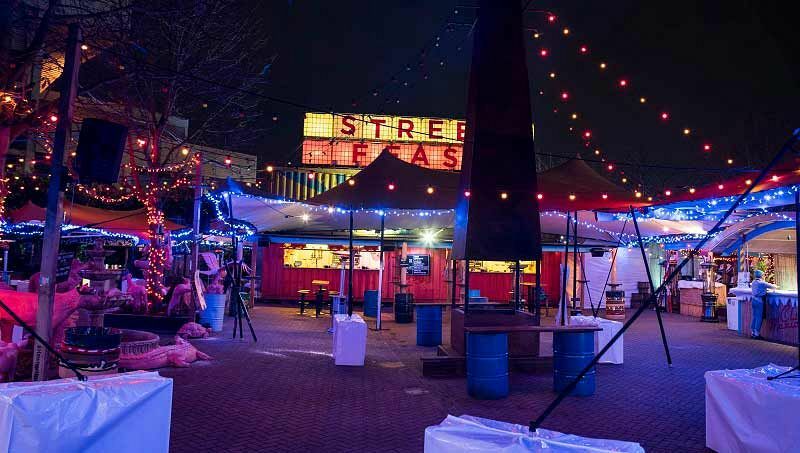 For a unique Christmas party in London this festive season, look no further than this incredible warehouse venue situated in the city’s Canada Water area. The venue is a huge indoor food and drink space that’s completely versatile to create the ultimate Christmas party experience. The venue is located just a short walk away from Canada Water Overground and Underground Station, and is nearby to London Bridge, Borough and Canary Wharf. Accommodating up to 2000 guests across two rooms, those looking for a small exclusive event will be able to hire one side of the venue for groups of 200, right up to larger numbers looking to hire out the entire space. On arrival, you’ll be treated to a cocktail or sparkling wine drinks reception to mark the start of the evening, before preparing to indulge your senses in a whole host of tasty food. Here, guests will be able to use their tokens to receive the equivalent of one main and one side. Experience an incredible choice of sensational food from across the globe, all in one night! As for drinks, the venue will have your group covered with a bar tab. Each guest will be able to enjoy up to six drinks each across the nine brilliant bars. Drinks include: selected beer, wine, single spirit and mixer, and soft drinks. There’s plenty of space for you to play about in at this venue, which also features pool and beer pong tables. Add on's are also available which include; Entertainment acts, DJ’s, further food and drink vouchers - let the festivities commence! Staffing, hosts and security will be provided on the night, in addition to administration and event planning. 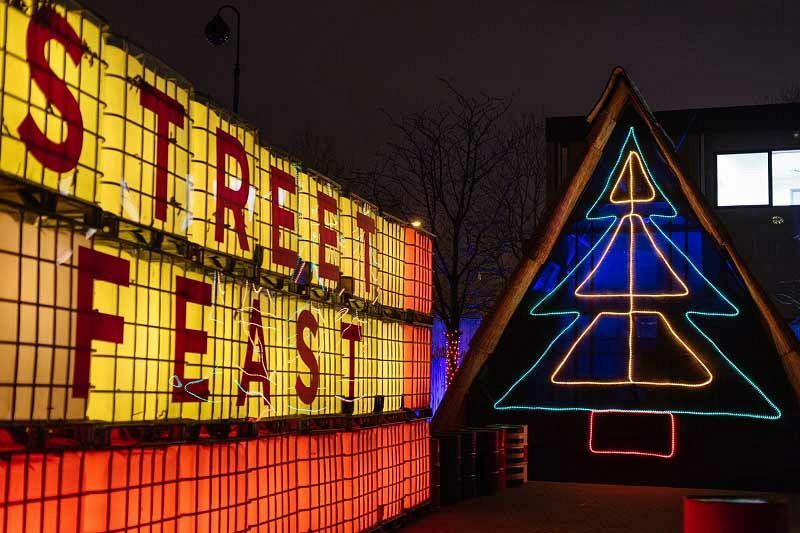 Send an enquiry through today and make your Christmas celebration in Canada Water completely epic! Please note that the headline price of £45.00 per person excluding VAT is dependent on group size and the date selected. Whole Venue – 500 to 2,000 capacity - Two massive rooms, 12 street food traders, and free reign of our biggest and best event arena. Available to hire every day of the week. Other Room – 300 to 600 capacity - Sprawling lounge with food trucks, counter-top dining, whisky, wine and mezzanine cocktail bars. Available to hire every day of the week. 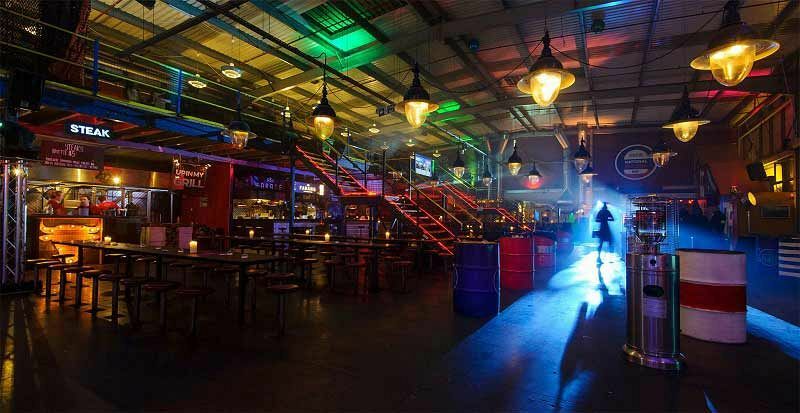 Big Room – 300 to 800 capacity- Huge hangar-style food hall with eight street food shacks, craft cans and draught beer. Available to hire every day of the week. Milk and Honey – 100 to 200 capacity - speakeasy-style cocktail bar with proper drinks, brilliant bartenders, hand cut ice and frosted glassware. Available to hire Friday & Saturdays only. The Deck – 70 to 120 capacity - Lounge bar with balcony overlooking the Big Room. Available to hire Friday & Saturdays only. 86 Bar – 30 to 60 capacity - Hideaway bar with secret entrance, one-way glass and short but brilliant cocktail list. Available to hire Friday & Saturdays only. 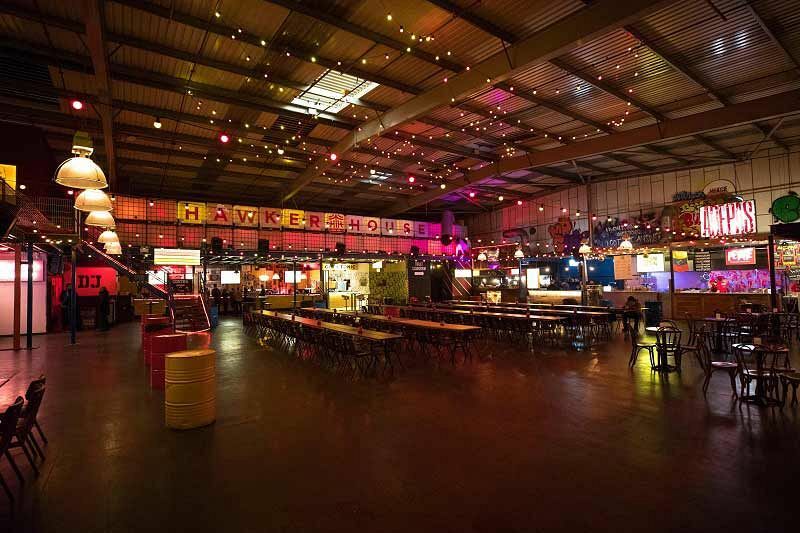 Street Vin – 30 to 50 capacity - Get cosy in our candle lit corner of Hawker House serving wonderful wines. Great street food deserves great wines. Available to hire Friday & Saturdays only.